There are a number of great and simple ways to spice up your bedroom life if you and your partner are looking to make things interesting in your lovely love shack. An effective and fun way is going the sexual route by boosting your passion, performance and play in the bedroom with some Bedroom Games. Here are a quick few, fun bedroom game ideas that we have put together and require very simple materials, but can provide loads of fun (and possibly lead to a bit of hanky panky of course!). 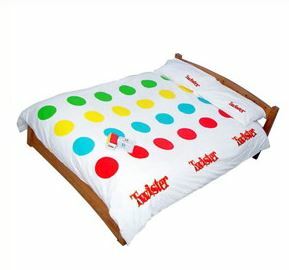 Good old Twister! To add sexual thrill to this game, play it naked! Add fun to your efforts of keeping yourself balanced on the coloured circles by kissing or licking your partner at the same time. By doing this, you will arouse your partner even before you finish the game and it will be a matter of who’s the quickest to quit! This is a fun game that only requires a piece of paper and a pair of dice. Get creative and match a sexual move to the number that appears on the dice after rolling it. Allow the mood to control your desires, experiment a little and see where the night takes you! Now, just about everyone played this as a youngster, so we’ll skip past the mechanics of this game. However, you need to modify this a bit when you play it in the bedroom. This is a great game to play if you want to get to know more about your partner's sexual preferences. This can help you boost your performance in the bedroom, but also helps you learn about each other, making love making even more satisfying for the both of you. Starting to feel nostalgic yet? We sure are! Adjust the rules of this game by going into a dark closet and telling your partner to join you. Once inside, tease each other by taking turns kissing different body parts...except for the lips. Keep doing this until one of you folds under the pressure, and goes for the lips. We have a feeling it might be a short time before someone cracks under the pressure, but hey, it’s a super fun way of testing yourselves on how long you can hold out! It's all about discipline people! If you’ve experimented with a number of ways to have fun in the bedroom thinking outside the box, feel free to try an Adult Board Game or similar. After all, that’s what they were made for! Games like Nookii and Monogamy have proven to be quite a hit for those looking at trying something new with their significant other. Above all, with whatever choice you might make, don’t forget to have fun and use your imagination! Enjoy folks! I like the idea of those 'adult' dice. I've seen some in shops with actions printed on them. Twister might be interesting... but who's spinning the pointer? !